The "Landing Incident" in Barangay Matab-ang! MATAB-ANG is a small barangay (village, or the smallest political unit of government in the Philippines) located as part of the City government of Talisay- then a small town about 7-km north of the City of Bacolod- the capital of the Province of Occidental Negros . Talisay City itself is one of the older pueblos (or towns) in the Province founded and developed by Fr. Mauricio Ferrero in the 1850s. Lone witness Mamerto Demetillo : respected by the village folks. . 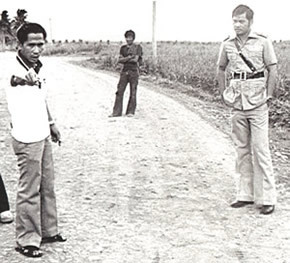 The incident involving the alleged "landing" of unknown objects on the soil of Barangay Matab-ang transpired in the early morning hours of April 26 1979, but- for fear of ridicule by the witness, or other unfavorable consequences, the incident was not immediately reported to local authorities. The lone witness to the incident, a local, well-respected resident by the name of MAMERTO DEMETILLO , married, 55 years of age (at the time of the interview), a resident of Brgy. 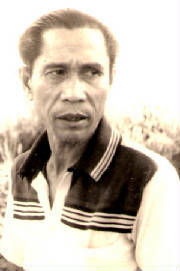 Matab-ang, Hda. 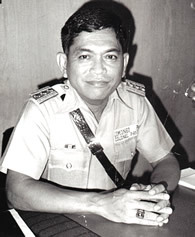 Granada, City of Talisay, Province of Occidental Negros, alleged that at or about 0200H or 0230H (AM), was working in preparation for the day's business in his house that 26th day of April 1979, when his attention was aroused by what seemed to be very bright "lights" that he noticed outside his house. The light could be seen through the slats of the bamboo walls and the window. His curiosity aroused, the witness then decided to find out the source of the lights. In trying to find where the bright lights could be coming from, the witness went outside of the house and to his amazement, the bright lights emanated from three (3) "objects" seen flying very low- so low that the witness could see them "glide" from behind a cluster of tall bamboo plants growing by the side of the creek that separated the witness and the objects. The witness then ran towards the bridge and positioned himself securely inside the ditch (a narrow canal by the side of the unpaved rough road) for a closer view of the objects. The 3 objects were all of the same shape- the shape of which is that of an "inverted bowl" with a flattened "dome" (or a "bulging" as the witness stated) at the upper portion, and very flat- straightened bottom portion. By the time the witness had crossed the bridge and was already crawling inside the roadside canal, the witness was also in time to see the 3 objects come to "land" on the roadside (opposite to the lcoation of the witness). As the 3 objects came in for a "landing", the witness also observed that from each of the object came out three (3) "landing pods" of sort which looked "metallic" in nature, and cylindrical in shape with the end (the point touching the ground) somewhat "more flattened" which the witness described as similar to "a duck's feet". These landing pods were alelged to have eventually left a two (2)-inch deep impression on the ground. When the objects had already landed, simultaneously, a "ladder" (or sort) having about four (4) or five (5) rungs, also came out from below the object. Then a "door" or opening of some kind (resembling a "hatch-way") opened from where the witness saw for himself the "occupant" (or entity) coming out. Two (2) other entities also came out from each of the other two (2) objects. All in all, each of the objects appeared to being operated by an entity each. The "entitiies" were observed by the witness to "walk" around their "crafts", with one of them "touching" the ground. The witness also felt that the "entitiies" were "communicating" with each other as they appeared to be "discussing" things among themselves while "gesturing" by ocassionally pointing to certain directions. All 3 entitities looked entirely the same (similar), and all wore a kind of ash-gray colored "helmets" (or headgear) that the witness described as coming right up to their "neck" and concealing what would have been their respective faces and heads. The entities were also described to be wearing what would seem to be like a "coverall" type of suit of some kind that meet up with the headgear. A kind of "band" about 2.5 inches wide appears to connect the point where the headgear and the suit meet up. Another aspect that the witness was able to recall was that there was a kind of "tube-like coil" about half an inch in diameter at part of the headgrear where the ears should be. All the entities in their respective "uniforms" resembled the human figure in all sense, leading the witness to initially think that they were probably "Russians", as they were estimated to be standing at about six and a half to seven feet in height, and flying some kind of new type of aircraft. One particularly strinking feature about the entities, according to the witness, was that they each carried with them something that appeared to resemble a "rifle" (a "Tommy gun" as the witness put it), The "rifle" were also "grayish" in color, the same as the color of their "clothing". The entities were also described to be "moving about" in a rather slow, sluggish manner, and the imprints created by their "shoes" were allegedly seen later that morning. The entities spent some fifteen (15) minutes outside of their "crafts", after which they (entitites) boarded it, entering in a "crouching" manner.. . .
BRIEF NARRATIVE STATEMENT / WHAT WAS WITNESS DOING IMMEDIATELY BEFORE THE SIGHTING EXPERIENCE? HOW DID WITNESS LOSE SIGHT OF OBJECT? DID WITNESS HEAR ANY SOUND ? DID OBJECT EXHIBITED ANY UNUSUAL FLIGHT BEHAVIOR / CHARACTERISTICS?